Happy New Year and best of luck to all in 2017. 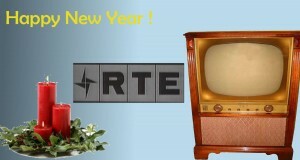 Many of you reading this post are probably watching TV at the same time or even commuting while reading your Irish Newspaper Archives updates, so just imagine the excitement the country must have felt as on this day 31st December 1961 at 19:00 Radio Éireann's television went out to the Nation with its first broadcast. With the New Year celebrations ahead the county waited with bated breath for the opening broadcast by President de Valera. The weather was ice cold with Arctic conditions and freezing frost. Posted in this week in history	and tagged with #RadioÉireann, #1961, 'IrishTV, #rte, #rte #Irishtv	by Andrew Martin.